Children enjoying the fruit of their imaginations in a Wonder filled home! The Pyramid Adventure is one of many learning experiences at the School of Wonder that helps children develop social-emotional competence, creativity, and metacognitive skills. 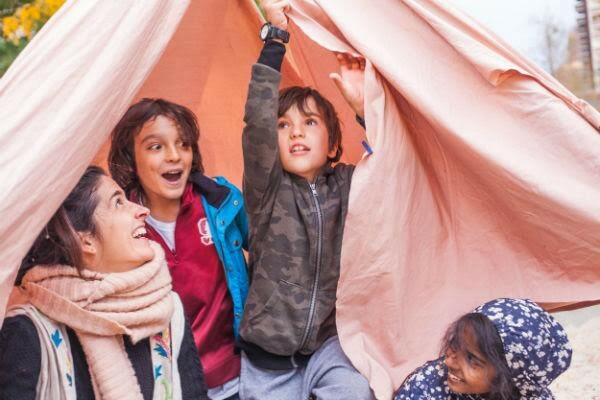 Co-created with talented artists from Future Clear Productions and Edventurists, this workshop gives children the mission to design and construct a home for the School of Wonder — similar in scale to a small installation. In a recent workshop, children built a structure resembling a pyramid out of bamboo sticks and other raw materials. Once built, children decorated the home, and then celebrated their collective achievement with music and a cacao ceremony. Throughout the construction process children are given almost total agency to explore their unique ideas as well as encouraged to actualize their vision through collaboration.